Greetings from YFL, and Happy May!!! Your YFL newsletter will be fresh on your email desk tomorrow morning at 10 a.m., so watch for it!!! This week it is time to incorporate hand weights into our asana practice!!! The practice will also emphasize bearing our own body weight more than we usually do on the mat!!! Our Sanskrit focus is “Bhakti”, or “our path of devotion”. The supporting hand gesture, or mudra is the “Pran”, or position for stability, “I shall keep going”. This mudra promotes strong eyes, inner peace, stamina, and confidence. The accompanying silent mantra is, “My inner fire possesses me, strengthens me, and reveals to me my abilities and my possibilities.” Our meditation focus is “Stability”, and you may choose to listen to the music below, provided by Deva Premal and Miten, “Kumara Mantra”. Intro to Yoga begins on 5/15 @ 7:30 p.m., and there is still time to register. Kim is offering her Reiki I training at the studio on 5/6, and Sophie’s quarterly offering of Yoga for Grief workshop will be on 6/23. The seasonal Drum Circle will be held on 6/24!!! There is much to be experienced at the studio over the coming months of summer. Please let us assist in bringing your mind, body, and heart into “Right Balance”!!! This entry was posted in Uncategorized on April 30, 2018 by Deb Potts. Your Choice: Wall or Classic Hatha?!!! Greetings from YFL!!! I’m baaaaaaack!!! Last week was devoted to recharging my batteries, and enjoying the vistas, food, and art of Santa Fe!!! I have many wonderful memories, and photos to share with all of you!!! I would also like to thank all the wonderful Yoginis that subbed my classes!!! I had comfort in knowing that my students and studio were in good hands!!! This week is practitioner choice (majority rules)!!! Each class will decide whether they want last week’s wall practice, or this week’s Classic Hatha!!! Our Sanskrit focus is “Dhanya Vad”, or thank you, as I express thanks to family, friends, and students for last week’s restoration vacation!!! I am also so very grateful that I have the privilege of sharing yoga and meditation with each of you everyday!!! Our mudra (hand gesture) this week is the “Moderation” gesture for bringing balance to our digestion, and all facets of our being. Our meditation focus is “Right Balance”, and the accompanying music is Ann Sweeten’s “A Moment in Time”. The next Intro to Yoga 4-week course will begin on 5/15. 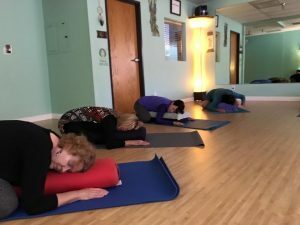 Sophie’s next Yoga For Grief workshop will be on 6/23 from 1-3 p.m. Please call, email, or drop-in to register. Your May YFL newsletter will release on your email desk at 10 a.m., Tuesday, May 1st!!! This entry was posted in Uncategorized on April 23, 2018 by Deb Potts. Greetings from YFL!!! This week is a surprise set of sequences!!! Come with anticipation, and be ready to experience something new and different on the mat at YFL!!! Our Sanskrit focus is AUM , Shanti, Shanti, Shanti, or chanting for Cosmic Peace. Our supporting hand gesture will be the “USHAS”, for connecting to all things good. The meditation focus is the same as our Sanskrit focus this week, AUM, Shanti, Shanti, Shanti. You may contemplate this topic while listening to the music entitled, “Meditation”. The next Intro to Yoga 4-week series will begin on May 15 and extend through June 5th. Please register via phone, email, or drop-in. Sophie will be offering her Yoga for Grief workshop on a quarterly basis at Yoga For Life. The next opportunity to access this valuable work will be on June 23rd. Registration is ongoing. She will also make this available for individual or family bookings at YFL. The annual Yoga-Hike is scheduled for April 27. We do ask that you register for this by no later than 4/20. It is going to be another great week at YFL, and as always, we can’t wait to see you on the mat!!! This entry was posted in Uncategorized on April 14, 2018 by Deb Potts. Greetings from YFL!!! 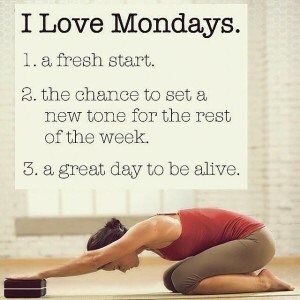 Another Monday, and another week upon us!!! After last week’s rigor with weights, this week we shift gears, and focus on relaxing, renewing, and restoring!!! We will use props to allow our mind and bodies to release into supported ways of stretching. Our Sanskrit focus is Lila Hum, a mantra for celebrating freedom, joy, or our true wisdom of begin lighthearted and playful. Our supporting mudra, or hand gesture is the Drum Mudra, which allows us to release nervousness and tension. The meditation focus is “Be Playful and Light, and Free”!!! The supporting music is the famous “Claire de Lune”. I would like to extend a huge thank you to Sophie, and all her participants in the Yoga For Grief workshop this past weekend. The reviews that I have received have been most favorable, and I will encourage Sophie to offer this important work at YFL again in the near future. Also, please note that Sophie’s Ayurvedic Yoga four week session has been canceled for the time being. Deb’s next Intro to Yoga will begin on May 9, and extend through May 29. Please call, email, or drop in to register. This entry was posted in Uncategorized on April 8, 2018 by Deb Potts. Greetings from YFL, and happy April!!! Another month is complete, and we begin our second month of the Spring season!!! As we do traditionally, we kick off the new month with our weight practice, so Let’s “Weigh In” together on our mats!!! We will be sculpting, toning, and strengthening via our traditional weight bearing asanas, and add in hand weights (optional) for part of the practice. Our Sanskrit focus comes from the 21- day meditation challenge with Oprah and Deepak, “Har Haray Haree”, which activates our light of vitality, energy, and healing. The hand gesture or mudra focus for the week is “The Let it Flow”, or “Relaxation Mudra”, which promotes tension and stress release!!! The meditation focus will be “Let it Flow”, and the supporting music is Ann Sweeten’s, “A Place in the Sun”. It is a very busy month at YFL. 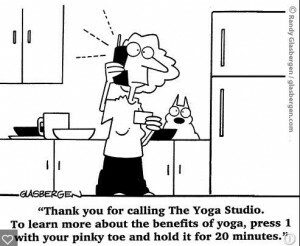 You should have received the monthly newsletter via email yesterday, but if not, please email a request to be placed on our Contact List, yogaforlife06@verizon.net. The newsletter and our website (www.yogaforlife06.com) list all the current and upcoming Special Events for the month and season. Please consult those sources for all the details about upcoming workshops, etc. 4/7-Yoga For Grief, 4/9-4/30 Ayurvedic Yoga, 4/27-Yoga Hike!!! This entry was posted in Uncategorized on April 2, 2018 by Deb Potts.